A very highly insulated and fully waterproof/breathable overboot designed to integrate with our high altitude expedition boot range. The Expe overboot provides incredible warmth and protection against the elements for high altitude mountaineering and polar expeditions. > Outer material in tough and fully waterproof and breathable Cordura/Sympatex laminate with fully taped seams. 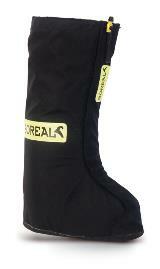 > Triple layer Thinsulate and polyethylene foam insulation layers fully surround the foot providing incredible warmth with no cold spots. The Thinsulate is placed within the gaiter without the use of adhesives and with minimal stitching thereby maximising the loft and effectiveness of the insulation layers. > Lightweight and insulative EVA sole. > Adjustable elasticated drawcord for a comfortable fit around the leg. > Secure velcro and zip front closure.